Barry the Baby Shoyru was playing marbles last night - and he forgot to put them away! Now they are very, very angry. It's your job to help Barry guide his marbles back into his toy box before they escape and wreak havoc upon all of Neopia! The actual controls for this game are quite simple - Use your mouse to click on the bumpers, activating them. The bumpers are the little triangles that make up the background. They alternate directions, which makes the game tricky - so watch out! The Marbleman will follow in the direction in which the bumper is going. You can use combinations of bumpers to your advantage to get your Marblemen into the toy box before the time runs out. The following are important main components to each level. Bumper - Click to activate them and guide your Marblemen into the toy box. Toy box - You must put all of the same colored Marblemen into the same colored box or you will lose a life (but don't worry about colors until the later levels). Coin - Causing a Marbleman to hit this will earn you 10 points. Block - Marblemen will bounce off of this in the same direction that they came from. 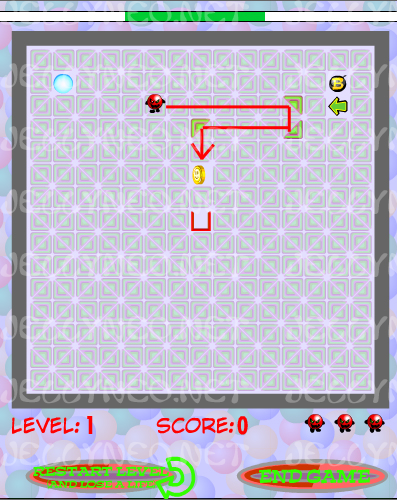 Bomb - If your Marbleman hits a bomb you will lose a life, unless you are protected by a shield. Arrow - Running over one of these will redirect your Marbleman in the direction indicated. Shield - Run over this shield, and temporarily protect your Marbleman from bomb explosions! 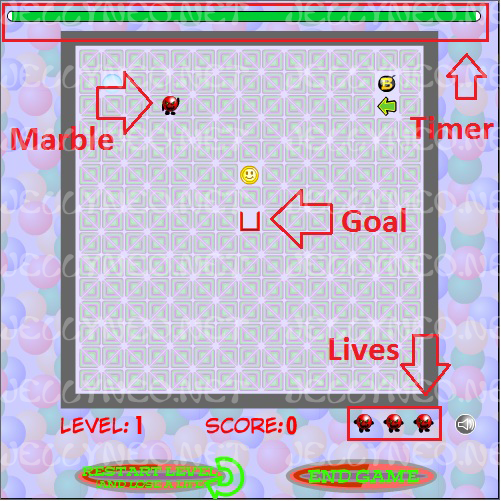 The way I play the game, there are two main ways, or techniques, to control the Marblemen. The first technique is simply to use the bumpers to turn your Marbleman around into the direction needed. To do this, set up two bumpers that would make the Marbleman go in a somewhat "]" direction, where it hits one bumper then the next, going back the way it came from. The second is what I call the "bump or block" technique. Bumping the marbles back in the direction which they came from will open up new opportunities to send marbles in the right direction. 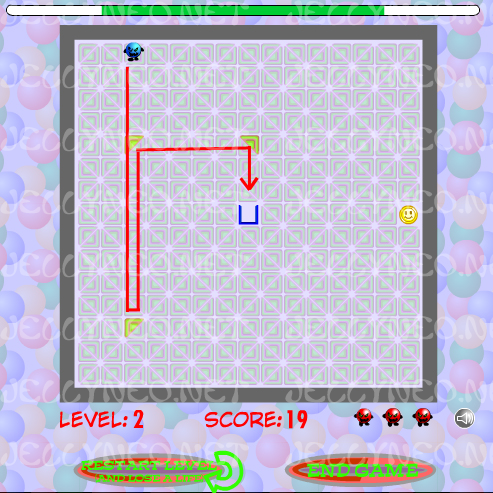 In the example above, do not click the upper most left bumper until the marble passes that area. If you press the bottom left bumper that is activated in the diagram first, it will give you time to click the other two! Timing and strategy are both key in this game. Every five levels you complete, you'll unlock a new level code. If you save that code, you can enter it in subsequent games to start at that level. Remember, though - your score will still start at zero! The first 98 levels are unique and some can be quite challenging. After level 99, though they are all the same except for the fact that your allotted time gets shorter and shorter until it's impossible to complete the game in the time allotted. One last point scoring-wise that I want to touch on is simple - get coins whenever you can! Each coin is worth 10 points towards your score, and those points add up! This game can be very discouraging considering that most find it difficult to get past the first few levels, let alone the original 99. Don't be discouraged though! I could give you all the tips and tricks in the world but the one thing that this game requires for mastery is practice. Lots of practice.